New York's terminus for interstate trains is undistinguished, but functional. 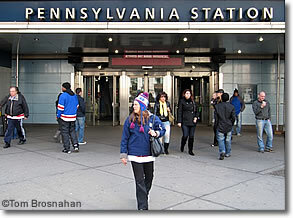 New York City's Pennsylvania Station on the east side of Eighth Avenue between 31st and 33rd Streets (map), is the city's principal station for Long Island Rail Road suburban and regional trains from Manhattan to Long Island, and for Amtrak intercity and interstate trains to New England and other US regions. The mundane (well, actually, ugly) appearance of the building's exterior does not reveal its function, so entrances to the station are difficult for non-New Yorkers to find. Get to Madison Square Garden at 8th Avenue and 33rd Street (map), and ask. The heart of the station is the subterranean main concourse with its annunciator board listing all the arriving and departing trains. Trains are in the station and available for boarding for only a few minutes, so the concourse is full of passengers waiting for the annunciator board to show their track number. When the track number appears on the annunciator and is announced on the public address system—usually only five to eight minutes before train departure time—passengers go to either the East or West track-numbered escalators and descend to the track to board the train. Amtrak has a tidy waiting area for its Acela express train passengers. Show your Amtrak ticket to enter. There's free Wifi. Shops, snack stands, a bar and restaurant are on the sides of the concourse. Long Island Rail Road trains are boarded in a separate, lower part of the station. Follow the signs. Numerous MTA subway lines can also be accessed beneath Penn Station. Grand Central Terminal, New York's other major railway station, is for commuter and regional trains. It's located at Park Avenue and 42nd Street (map), 13 blocks (1.5 miles/2.41 km) northeast of Penn Station: walk north 9 blocks north on 7th Avenue, then 4 blocks east on 42nd Street. You can walk between stations in about 45 minutes, 35 if you have no luggage and you walk fast. A taxi might take 15 minutes once you actually get in a cab (there may be a waiting line for taxis). Pennsylvania Station was once a grand Doric-temple monument to 20th-century progress, but the imposing original station, designed by McKim, Mead and White, was razed in 1964 to make way for a new Madison Square Garden sports and show arena, and an office tower, with the charmless but functional station beneath. Click here for more on the dolorous history of Penn Station. 33rd Street & Eight Avenue, New York City. Below, the charmless but functional station.